One of the least discussed benefits of ebooks and digital publishing is how they are giving rise to interesting new literary forms. Self-publishers, being more nimble and less constrained than trade-contracted authors, are finding fruitful niches and changing what it means to write and read a “book”. The greatest difference between an ebook and a pbook is that the latter is shaped by the demands of the book trade. This is why the vast majority of titles falling in around 100,000 words in length. Ebooks allow stories to be exactly as long as they want to be. If early indications are anything to go by, most of them want to be between 10,000 and 35,000 words long. This has the makings of a whole new genre in both fiction (something between a short story and a novella) and nonfiction (between a magazine article and a book). Many of the people getting involved in publishing such short form work have a background in magazines rather than books. John Tayman and Mark Bryant, of Outside magazine, created Byliner.com on the back of Amazon’s Kindle Singles. Byliner Originals now boast the bylines of Taylor Branch, Mark Bittman, Ann Patchett and Amy Tan. In a recent article for The Guardian, Don’t Look for eLiterature in Novels, Dan describes how a great deal of literature emerging from the new technology is not in traditional forms. How, indeed, many of the new forms disrupt or play with the shape of the old and are shaped by what he calls the “tangential mind” facilitated by the internet. Such alt lit is only one emerging change in what and how we read. 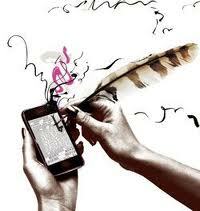 New technologies are giving rise to many new literary forms: books as apps, serialised stories, the cell-phone novels so popular in Japan, multimedia books; books as online courses and many more. What do you think of the development? Have you written in any new or unusual forms? Tell us about it in the comments below. I utilized a serialization of Meadow Of Gold: Uploaded Fairy Saga. Interestingly back in the 19th century that was how fiction was released–in magazines and serialized until finally collected in book form. You still have this in manga magazines in Japan. But for whatever reason the modern prose world had made serialization in trade publication the way of the dinosaur. Not sure I agree with interactive books being books in the traditional sense, though I’ve known people that tried to make the argument. That’s just interactive fiction. Think text adventures from the early computer games era. This was a good post. Useful. What a wonderful post – thank you, Orna. I love how liberating and innovative self-publishing feels, and it’s wonderful to hear what people are doing with it here in the comments. I’m surprised by how many people write short stories, and novellas, too, for that matter. I see a lot of Amazon reviews by readers who are angered by purchasing a story, only to find that it’s a short one; and the fact they had to pay $2.99 for it makes them madder. Personally, I’m not a fan of the short story, and I’ll tolerate a novella, writing them now myself only to get a body of work out there a little more quickly for readers (I’m a new author). I’m thinking most readers like longer works like novels because they want to be pulled into the story and connect with the characters. And let’s face it, that can be tricky with a short story or novella or anything in between. I’ll only buy a short or “shortella” from someone with whom I have some semblance of a connection: Facebook, writer’s group, Twitter. Just my two cents. I think one of the great advantages of digital publishing is that it gets over the psychological barrier of novellas seeming “too short” because they’re slim volumes. Some of the most exceptional books of the 20th century were novellas, and it is a real loss to literature that publishers were for a long time so wary of them. The growing popularity of small and in translation presses such as Peirene, who only publish collections and novellas, many of which are the equal or better of any novel, and the fabulous Art of the Novella range of Melville House has done something to rehabilitate them, and I hope digital publishing will go the full way. Like the short story, the novella is a completely different form with a different set of skills and disciplines from that of novel-writing required to make it work. This is exactly the reason that I ended up self-publishing without even trying to break into the traditional realm. I fretted for months in how many words I should be shooting for and as I worked through the story it became more and more apparent that I wasn’t going to make it to novel-length. As soon as I let the word count concerns fly away my story was able to follow its own course-wrapping up in 31000 words. You’re so right to remind us that it’s not just about digital. But you’re going to have to explain that throwaway last comment. A novel without words? it’s published on May 10th (after a *lot* of agonising about whether to self-publish or go with a small press, and a surprising amount of interest from small presses). It’s called Evie and Guy and it’s a novel written only in numbers. thank you for the very interesting article. I agree, the eBook, apps and online publication of stories are changing the way we tell stories and it is giving us the possibility to explore new formats. I am a Swedish novelist and I have published paper novels with Swedish and Finnish trade publishers. The last couple of years I have been working with an experimental project called “Simulated Real Time”, in which authentic material is published online accompanied by a commentary framework. By publishing documents (letters, diaries, official reports etc.) on the date on which they were written but a specified number of years later, an event can be reconstructed with exactly the same duration as when it first took place. The aim of this method is to gain greater understanding of an historical event in this way, using modern technology to bring it to life as vividly as possible. Thanks Torkel, fascinating stuff. I look forward to reading. Where you have a work which includes links to other material then this must always “supplement” your piece rather than take them away from it. A good and interesting foundation should always be built up before taking readers away, so that they want to return rather than exploring other routes away from your work. Thanks Ken, what’s your auto-biog called? Oma, it has the title of “Reflections of my life” and contains links to audio interviews from my radio career with people such as Tony Bennett and Howard Keel. I use Amazon Kindle to sell it – but for those without a Kindle device then they can download it for free from my website as a PDF file. That PDF file also allows me to utilise links to Amazon via their Associate scheme. Thus – people can read about the background to my interview with pop star Billy Fury, they can then listen to it and if they want to buy a Billy Fury CD from amazon then the link will allow them do so, with me earning a royalty percentage on the Amazon CD sale. It is all about the diversification of one product into different marketing areas.